With over 40 years of experience in the development and production of enzymes for molecular biology, NEB offers the most extensive selection of high-quality and performance-optimized DNA ligases and master mixes to streamline your experiments. 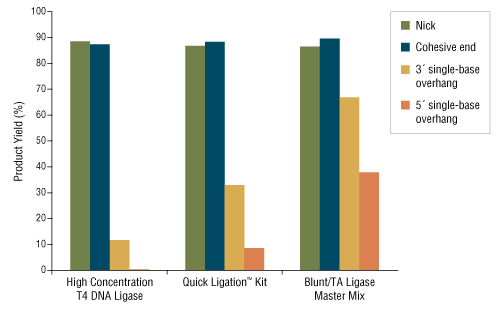 For added convenience and accuracy in your ligation reaction setup, try our DNA Ligase Master Mixes. These pre-mixed, ready-to-use formulations include a proprietary ligation reaction enhancement agent for improved performance. For your convenience, master mixes are available for every end type: Instant Sticky-end Ligase Master Mix (NEB #M0370) for sticky ends, and Blunt/TA Ligase Master Mix (NEB #M0367) for blunt or single-base overhang ends. Learn more about NEB's quality controls for DNA ligases. Reactions containing 20 ng of pUC19 digested with SacI/SphI, and a 3-foldmolar excess of a 1.6 kb fragment from a different plasmid with compatible ends were set up using the Instant Sticky-end Ligase Master Mix. 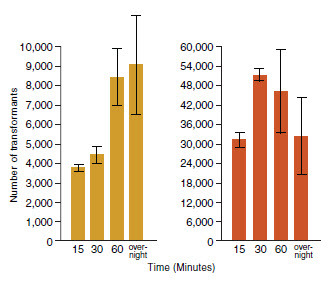 Without any additional incubation time, 2 µl were immediately withdrawn and used to transform a 50 µl aliquot of NEB 10-beta Competent E. coli (NEB #C3019). A 50 µl aliquot of the 1 ml outgrowth was plated onto a selective plate and incubated overnight at 37°C. 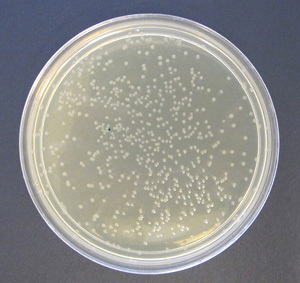 Results show that several hundred colonies wereproduced. Ligation reactions containing equal amounts (20 ng vector and 3-fold molar excess of insert) of blunt (A) or T/A (B) vector/insert pairs were set up using ElectroLigase and incubated for the times shown. After heat inactivation of the ligase, 2 µl of each reaction were withdrawn and directly used to transform NEB 10-beta Electrocompetent E. coli (NEB #C3020). 50 µl aliquots of the outgrowth (diluted, in some cases) was plated onto selective plates and incubated overnight at 37°C. Colonies were counted, adjusted for plating dilution, and graphed. Electroligase® is a registered trademark of New England Biolabs. SilverXpress™is a trademark of Life Technologies, Inc.
Ligation of blunt ends and single-base overhangs require optimized reaction conditions. Polyethylene glycol (PEG) is an important reagent in ligation reactions, find out why. Find out how the downstream application dictates the best reaction conditions for ligation. The optimal reactant ratio is contingent upon the downstream application.